Forgive me! but today I got to talk about this "Frontline Commando" game a little bit. I have been battling with this game for some time and with my observation so far, the game is really worth giving a trial. Have you been around the Andriod market for sometime or the Google play Store for some interesting applications, such as, games, browser application and many more, you will observed that you are missing a lot. That’s by the way though, today, I think I am going to talk more about the game “Front Line Commando.” I stumbled on this game few weeks ago on a friends’ android phone. He was actually playing it when I saw it and i took over the mantle of gaming for the whole day. I have never been so entertained for some time now since I pay little or less attention to games. Have you ever thought of running a game on your android phone? just imagine buying an android phone like the Samsung Galaxy S5 or the HTC One M8, and you are still uncertain about the type of games you should be running on the phone, that could mean indecision especially if you are that type that loves gaming the whole day or during your leisure period. Are you looking for that game that would keep you entertained for some time? then the Front Line Commando” is really worth paying an attention to. You must download this game if you are that type of person that loves playing games on your phone. As the sole surviving Commando of a renegade attack against a ruthless dictator, you are stranded on the frontline and hell-bent on payback. You must use all of your specialized skills to survive the onslaught of the enemy forces and avenge your fallen soldiers.The ultimate 3rd person shooter with stunning console quality visuals, precise controls, advanced physics and destructibles. 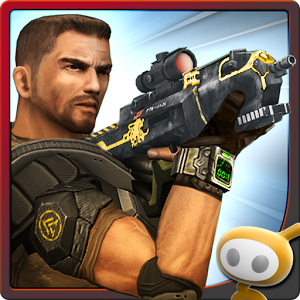 Jump in the heat of battle and push your Android device to the limit! Emerge from destructible cover points to take down helicopters, jeeps and heavily defended enemy bases. Fight off increasingly difficult waves of enemies over a variety of combat mission types.Take to the frontline with an artillery of assault rifles, sniper rifles, shotguns, rocket launchers, med kits, armor and more! The Frontline commando is more like a mission game. It kind of takes a little shape of the popular gaming platform “Mission Impossible,” but there is a great deal of differences in whatever you do. Frontline commando requires you to save nations, communities, villages, houses and a host of others. You are given Ak45, 47, Bombs, missiles, Pump Actions and a host of other weapons to combat your enemies. Your role is to eliminate every threat you see but be careful of civilians. Since I tried it on Gionee P3, and a tecno device (All android) I think it will be wise for you to download this game. It can be gotten from the android play store. To download the game, simply click on download FrontlineCommando and download Frontline Commando 2. Haba! So you mean you are not going to tell me how you felt about the game? that is not fair na, use the comment box below to tell me your experience about the game. Your comment will assist me in improving the quality of this post. That will be nice. Please hurry up and do so. Thanks for sharing the introduction of the game and would surely download it.